Brit processor designer ARM has drawn up a quad-core Cortex-R8 CPU so storage drives can cope with the demands of increasing capacities – and phones can download stuff faster. The Cortex-R family is aimed at real-time applications: code running on the cores must react to interrupts and other events within tight deadlines and in a deterministic way. When signals come in from the hardware, code has to run, decisions must be taken, and signals sent back to peripherals within fractions of a fraction of a second. 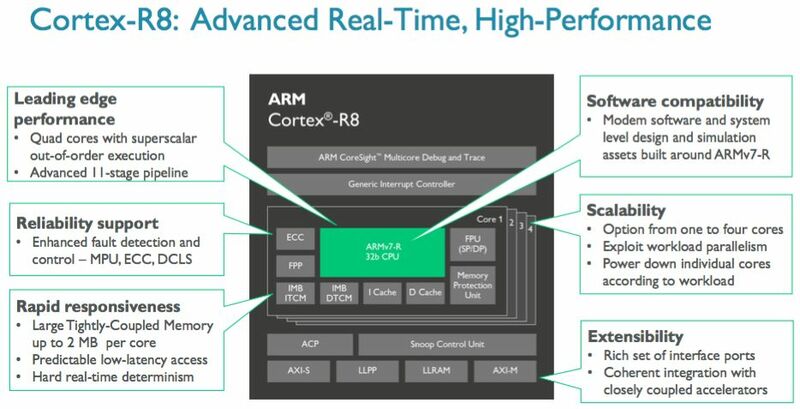 ARM says its Cortex-R cores are the number one CPU architecture in the storage world, and are used by all disk and flash drive manufacturers. The 32-bit ARMv7-R Cortex-R8, the successor to 2011's R7, boasts up to four cores. This is supposed to give it enough oomph to power storage drives that are expected to deliver more and more IO operations a second, implement better and better error correction, and perform with lower and lower latencies. R8-based controller chips are expected, therefore, to keep up with future storage densities and transfer speeds, which means better drives in your servers, PCs, laptops and fondleslabs. The R8 will be used in disk servo motor control, flash controllers, and future 5G cellular modems, where precise split-second timing will make or break a product. The R8 is not too dissimilar to the R7: it has an 11-stage pipeline; out-of-order execution; a memory protection unit to trap bad RAM accesses by buggy software; up to 2MB of tightly coupled memory per core; error correction and detection within its caches and RAM; ability to power down cores that aren't needed; and more. Having a quad-core CPU in a storage drive or modem is not a crazy idea. In these sorts of real-time embedded systems, each core will be tasked with a particular role so that it can guarantee it will be able to run a given thread when required. Alternatively, one core will act as a redundant shadow of another core: both cores will run the same code and access the same data in lock step. If the two cores diverge then a physical fault has happened, such as a bit randomly flipping in memory or a signal delay. This divergence can be detected and corrected.